Setting the stage for the O'Connor Sisters’ trilogy, Raj Lowenstein announces the release of “Love Behind the Lies” (published by Trafford Singapore), the first volume in the series that follows the life of Catálan Orlando Teresa O’Connor, aka Cat Connors, in the midst of the thrill of danger and love. 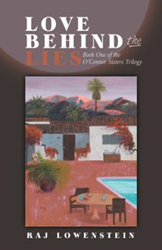 Those who would like to know more about her exploits may visit https://www.amazon.com/Love-Behind-Lies-OConnor-Sisters/dp/1490788441. The talented and beautiful Cat Connors has grown coldhearted. After completing her latest project, Cat witnesses a drug lord murder one of his minions. Now under witness protection, Cat is reunited with her first love, Haneul Palan Song, who is with the FBI. But what if Agent Song becomes more of a threat to her than a cold-blooded killer? “Love Behind the Lies” is a fiction that blends romance and action into one gripping story. Readers are ushered into a world without the trappings of fame and grow to understand the meaning of love and friendship through the characters’ lives. From a deaf family to a gay couple and everything in between, the novel portrays a world of diversity and the issues that come with it. “Love Behind the Lies” tells a story of second chances and letting go of the past. Raj Lowenstein lives with her husband and a boxer husky mix dog in the Pacific Northwest. Their three children and three grandchildren live in Colorado and Texas. She has a bachelors’ degree in American Sign Language interpreting with a minor in Jewish studies from the University of Houston. Apart from “Love Behind the Lies,” she has previously published a suspense thriller titled “Through the Fire.